I like to think of an aura as an outline of what you do, think and experience in your life, both internally and externally. I’m not going to completely break down the aura just yet—this lesson is more about how to see one. It will take practice and patience, so like I said, be easy on yourself. First, hold your hand in front of you and look at it. I like to think of an aura as an outline of what you do, think and experience in your life, both internally and externally. I’m not going to completely break down the aura just yet—this lesson is more about how to see one. It will take practice and patience, so like I said, be easy on yourself. First, hold your hand in front of you and look at it. Notice how your eyes are like a camera—you can zoom in or out to see the image of your hand. Now close your eyes, and this time, when you open them, look at your hand and let your eyes look to the side of your hand, about one inch away. Don’t focus on anything in particular, just look into the open space around your hand. You will start to see a transparent glow or glare around it. Some people even see a glowing light. Everyone is different and will see things differently—and that’s exactly how it should be. Just see what you see. 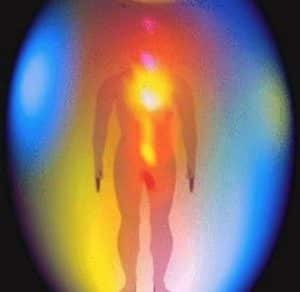 Once you’ve mastered seeing an aura around your hand, move on to a plant or tree. Same technique and same patience required. When you have mastered this, now you’re ready for people. When you get the hang of it, your body will adjust itself to this upgrade in seeing. Notice if you see any colors. Don’t worry too much about that—it will come in time, but if you do see some colors, fabulous. I haven’t focused on colors yet for this column, so if you do happen to see them, pat yourself on the back, you’re getting advanced. But for now, let’s get you used to the basics—crawl before you walk. Practice makes perfect, so keep practicing. For the skeptics who are thinking, “Who cares about this?” what if I told you that this is the beginning of expanding your ability to see all the energy that’s around you? To be a truly evolved being requires all of the resources that Source gave us, not just the ones the world tells us to use. I know our world can be temporarily blinding, because the media and marketers want you to read the billboards and ads and watch TV so you can consume more crap that keeps you focused on material gain. But you’re not fooling me. I know you all have seen something at some time, a hint of light—something moving in your peripheral vision. Or perhaps you’ve felt a presence near you that sent the hairs up your neck to standing ovation. Whatever the case, you’re ready for it. So have fun and remember you’re not crazy—you’re just evolving. God, I love that word.